Success in the rescue of the "Lost Battalion" was due in large part to a military road constructed by the 111th Engineers of the 36th Division. A Presidential citation has been awarded the Engineer Battalion (and Company C, 232nd Engineers, attached) for the achievement herein described. For nineteen days in October and November the 111th Combat Engineer Battalion with Company C, 232nd Engineers, attached, labored on the construction of a tortuous, seven-and-one-half mile mountain road under the most adverse conditions. The completion of this road, only supply route for nine battalions of infantry, three companies of tanks, one battery of antiaircraft artillery, and a medical evacuation unit, and the maintenance of another 125 miles of rapidly deteriorating road in the sector, permitted the 36th Division to continue its painful offensive operation in the wilderness forests of the Vosges Mountains and rescue the 141sts "Lost Battalion." Muggish October weatherrain, mist, coldcovered the front. For nearly a month, since the crossing of the Moselle, troops had sloshed about on muddy trails and picked their way through the dense forest preserves of the Vosges, fighting Germans from tree to tree on the highlands off the main roads. Gains were slow and costly enemy infiltrations on the broad front frequent. Incoming artillery fire, bursting in the tree tops and splintering every way took a heavy toll in dead and wounded and left many a veteran shaken in terror. Engineers constructed a plank floor over sections of seven-and-one-half mile road to "Lost Battalion.,"
Still the attack moved on. It was hard on the men but pressure had to be maintained lest the enemy be given opportunity to solidly close a strong defense on the mountain barrier. In the black forests west of Bruyeres a huge salient began to take form as the 36th, reinforced by Nisei of the 442nd Infantry Regiment, pounded out slow but steady gains. The engineering problem in support of the operation was immense. Heavy rain and snow waterlogged the trails. Roads had to be built from scratch. The Engineers, whose feats had included helping the 36th across the Doubs and Moselle Rivers, who had removed thousands of mines en route from the Riviera beaches, who had cleared scores of roadblocks and who had been called upon to spell a turn with the infantry in combat at Montelimar, were again called upon to keep the Division rolling. Orders to the 111th Engineer Battalion of October 22 stated: "First priority to construction and maintenance of roads along axis of advance of 141st Regimental Combat Team." On the following day the 1st Battalion, 141st Infantry, started to follow a cart track along the wooded ridge line toward its objective. One platoon of engineers accompanied the assault company clearing mines, removing trees and making hasty repairs on the road. Additional engineer reconnaissance parties searched to the flanks for a better route. The cart track soon turned from the direction of attack, the troops following a narrow twisting lane through the trees, barely wide enough for passage of a jeep. Another problem became evident: the soil was a moist, decaying vegetation with an unstable crust of grass and roots. Considerable work would be necessary even to maintainthe road for light traffic. Lead infantry elements ran into enemy resistance as it grew darker. The Engineers, immediately behind, began work on the road. On October 24 the 3rd Battalion, 141st, was committed. It was now apparent that extensive labor would be required to supply two battalions, for the road had started wearing down immediately after it was first used. Then, since the regimental commander wanted tanks up on the hill to blast the enemy from their positions, the Engineers worked incessantly to prepare the trail for tank use. One platoon of medium tanks and a platoon of light tanks joined the 1st and 3rd Battalions high on the ridge northeast of Belmont. By this time enemy resistance had stiffened considerably and German artillery fire came crashing in on the engineers as they worked. While the road had been sufficiently sturdy to allow tanks to get up to the top of the ridge, the heavy vehicles tore out the bottom completely. The trail, already soft and watersoaked, was churned into one continuous mudhole by the tanks. Heavy rains aggravated its condition. Additional engineers were rushed to check deterioration, cut trees, drain ruts, and remove mines. During the afternoon a furious German counterattack, directed at the supply route behind the Battalion, overran the Battalion command post and drove a wedge between the 1st and 3rd Battalions. This stroke cut off the 1st Battalion and left it isolated. The 2nd Battalion was committed as soon as possible in a counterattack to drive through to the isolated unit along with the 3rd Battalion. At this time the trail was supplying three infantry battalions and a tank company. Rations and ammunition were driven up the steep trail that rose 1,000 feet above the valley floor, and wounded and dead were evacuated from it. One platoon of engineers, with the battalion that now became known as, "the lost battalion," had fought their way back to our lines during the initial enemy assault. They had removed many mines during the advance and patched the trail with rocks and brush. A constant stream of supplies became necessary to support the drive to the "lost battalion." The initial packing of rock and gravel that had enabled jeeps to pass, either disappeared under the heavy treads of the tanks or turned up between the ruts to damage undercarriages of small vehicles. Corduroy was placed on the worst patches. But since the surrounding woods had been heavily sown with anti-personnel mines, corduroy was expensively secured. 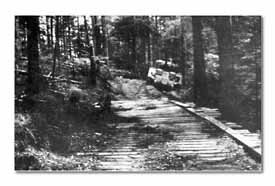 Timber from all the saw mills in the area was hauled to the top of the road and a plank floor laid perpendicular to the road. Trucks were diverted from the timber haul to secure gravel to cover the boards. Soon splintered under steel tank treads, two gravel pits were constructed along the side of the trail and were worked constantly. Numerous times, while short sections of road were torn up, by-passes had to be built since the tactical situation did not permit traffic to wait for repair. On October 26 the 2nd Battalion, 442nd RCT, was committed in the attack, with the 100th and 3rd Battalions, 442nd being committed on October 27. The 2nd Battalion, 143rd Infantry, on the right flank was also using the trail, increasing the total to six infantry battalions and one tank company. Continuous heavy traffic during the day necessitated night work whenever possible. Engineers patrolled day and night to remove trees felled across the road by enemy fire. Bulldozers were spotted at critical points to tow bogged-down vehicles. Luminous markers, made from white paint and tracing tape, marked the road for night driving. The engineers halted in their work only long enough to eat, and slept only long enough so that they could continue to work. The Germans determined the location of the road and constantly harassed it with artillery. Ammunition, being used prodigiously, had to be moved up over the road, and casualties evacuated. As the road grew longer, enemy snipers infiltrated behind our lines and wounded several of the engineers. Some men of the 111th engaged the Germans in a fire fight while the remainder continued the work. Extensive labor on the road could never be stopped. On October 30 the "lost battalion" was finally contacted. At this time there were seven Battalions of Infantry, three companies of tanks, one company of anti-aircraft artillery, and one medical evacuation unit using the road which was now four and one-half miles long. Ambulances and litter jeeps succeeded in evacuating the wounded and sick of the battalion which had been cut off for a week. Even though progress was being made by our troops, the enemy never diminished the intensity of his artillery barrages, and the engineers, working directly behind the assault companies, continued to lose men. The 141st Infantry, its average rifle company strength now down to 83 men, was relieved by the 142nd and elements of the 442nd. Though traffic increased during the relief, and the rains and snow undermined sections of the road, it was always kept open. Angle dozers, working closely behind the leading elements, drew artillery fire; three of these were destroyed by enemy shells, two operators were wounded and one killed. On November 4 the road was completed and then improved and maintained until November 11 when the 142nd Infantry cleared the last Germans from La Houssiere and Cours Mountain to open the Laveline-Les Poulieres-La Houssiere road as a main supply route. Throughout the nineteen days of this action the 111th Engineers bad overcome every conceivable obstacle in constructing a main route of supply for units of four infantry regiments and three companies of tanks engaged in a fierce battle. Part of the cost included 57 engineer casualties. Said General Dahlquist: "This action by the 111th Engineer Battalion was the most outstanding feat of combat engineering I have seen since the Division came to France." T/SGT. CHARLES COOLIDGE, 141st, Signal Mountain, Tennessee, dueled two enemy tanks with a carbine and advanced alone to blast a German attack which threatened to turn his battalions flank. He won the CMH.